Published: April 10, 2014 at 10:14 p.m. Updated: April 12, 2014 at 10:08 a.m. The AFC East remains Patriots country. Sure, this has been the case pretty much since Creed ruled the charts, but New England has gained serious in-house separation in recent years. The Jets were a worthy challenger in Rex Ryan's early era in New York, but have since faded to the middle of the pack. The Dolphins can't seem to get out of neutral, and are just trying to move forward after last year's ignominy. The Bills are still the Bills. The Patriots have -- by light years -- the division's best coach and the best quarterback. Now they have the division's best cornerback in Darrelle Revis, who joined the team in free agency. What did your mother tell you about life not always being fair? There will come a year where the Pats will be knocked off their division perch. We haven't seen anything happen in the last few months to tell us that's coming in 2014. 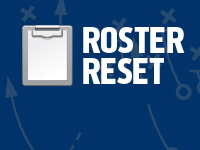 In our Roster Reset series, Around The League will rank teams in each division based on how much they improved this offseason. The AFC East is up next. » Revis Island relocates: Landing Revis was an organizational master stroke. Would you really be shocked if a healthy and insanely motivated Revis reclaimed his standing as football's top cornerback this season? He's a perfect fit in Belichick's defense and a substantial upgrade over the departed Aqib Talib. Brandon Browner was added to the secondary as well, and the move made smart moves to keep wide receiver Julian Edelman and defensive tackle Vince Wilfork in the building. These are win-now moves by a win-now team. The clock is ticking on Tom Brady, who turns 37 this summer. Robert Kraft and Bill Belichick know they don't have too many cracks at this thing before the golden age ends. Both the Pats and Broncos are racing against Father Time as much as each other. Landing Revis was a brilliant maneuver in the AFC arms war. » Tight end help: The Patriots reportedly visited with Owen Daniels and remain in the market for a "move" tight end after Daniels signed with the Baltimore Ravens. Rob Gronkowski is coming back from a significant knee injury, and his ability to stay on the field can be fairly questioned. Depth is needed here. » Staying in-house: The Patriots held on to the right guys, re-signing wide receiver Julian Edelman and working out a new deal with defensive tackle Vince Wilfork. Edelman gained Brady's trust and has expertly filled the void left by Wes Welker. Wilfork, coming off Achilles surgery, requested his release before the two sides worked out their differences. » A Blount question: It was LeGarrette Blount, not Brady, who carried the Pats' offense late in the season. Blount took his demolition act to Pittsburgh, leaving a void in New England's backfield. Belichick could use another option to add to a mix that includes Shane Vereen and Stevan Ridley. » Problem-solving on offense: Not many teams had a weaker roll call of skill players than the Jets in 2013. General manager John Idzik went about changing that gross structural flaw in free agency. Enter Eric Decker, a huge upgrade at wide receiver over the diminished Santonio Holmes. The addition of Michael Vick was also vital, giving Rex Ryan a much-needed QB option beyond Geno Smith. Ryan didn't get everything he wanted, of course. The organization passed on a Revis reunion, paving the way for the All-Pro's deal with the hated Patriots. Things got worse from there: The Jets were easily outbid by the Giants for Dominique Rodgers-Cromartie, then passed entirely on a reunion with Antonio Cromartie, who signed a team-friendly deal in Arizona. » Calling all corners: Dee Milliner made strides late in his rookie season, but making him the No. 1 guy now is asking for trouble. Dimitri Patterson has some upside if he can stay on the field, but the Jets could be compelled to use a first-round pick on a cornerback for the third time in five years. » CJNY: The Jets are in the mix for the services of Chris Johnson. They should do it. Johnson isn't CJ2K anymore, but he's a durable option who can slide into a three-down role if the injury-prone Chris Ivory were to miss time. » More playmakers: If the Jets don't take another cornerback in the first round, expect them to go wide receiver. This is a loaded draft class, and Idzik would be wise to pair a legit playmaker alongside Decker, who's closer to a top-notch No. 2 than a true No. 1. » Moving forward: The Dolphins couldn't get away from the stink and scandal of the 2013 season fast enough. The team hired a new general manager (Dennis Hickey), offensive coordinator (Bill Lazor), and signed 10 players to help remake a flawed roster. Will that be enough to contend in the AFC? It's important to remember that, despite all the drama around them, Miami came within one game of a playoff berth last season. There's no reason to think they can't take the next step. » O-line overhaul: It took a year, but the Dolphins located their replacement for Jake Long. Branden Albert instantly upgrades the protection on Ryan Tannehill's blindside. Jonathan Martin was shipped out of town and Richie Incognito is out of the picture (where he should stay). Right tackle remains a major hole that could be plugged with a high draft pick. » New face at RB: Whatever faith the Dolphins had in Lamar Miller appears to be lost. Knowshon Moreno is a more well-rounded player who earned Peyton Manning's trust last season. Moreno's plus-blocking skills are key: Miami must better protect Tannehill after a season in which he was sacked 58 times. » It's all on Ryan: The Dolphins scored seven points in their final two games last season. Tannehill deserves criticism for that, but it shouldn't be lost that the quarterback made positive strides in his second season. With a better supporting cast around him, Tannehill should continue to grow as a passer. He remains the most important player on the roster. » Laying low: The Bills had no intention of making a Mario Williams-like splash in 2014. They didn't overpay to keep Jairus Byrd and their signings were mostly modest: Corey Graham was added to the secondary and Aaron Williams was extended. The team seemingly overpaid to land guard Chris Williams, but he becomes an instant starter on the interior line. The Bills' best moves came at linebacker. Brandon Spikes was an expert run-stuffer in New England, and now slides into the middle of Jim Schwartz's 4-3 scheme. Kiko Alonso will kick over to the weak side, while Keith Rivers (another new face) is set to take over on the strong side. » In EJ we trust? : General manager Doug Whaley raised eyebrows at the NFL Scouting Combine when he said the Bills were "all in" on the QB quad of EJ Manuel, Thad Lewis, Dennis Dixon and Jeff Tuel. Manuel is the key, of course -- a 2013 first-round draft pick who left more questions than answers in his rookie season. » Welcome Mr. Williams: Mike Williams signed a six-year, $40.5 million deal with the Tampa Bay Buccaneers in 2013. In 2014, he was traded to the Bills for a sixth-round draft pick. The contract speaks to his potential. The trade value speaks to how monumentally he messed up his career in one year. » RB uncertainty: Both C.J. Spiller and Fred Jackson are entering the final years of their contracts. The Bills are believed to be in the mix for Chris Johnson, but they'd be better off locking up Spiller with an extension. Spiller was absolutely electric in 2012. Last season's bum ankle shouldn't cloud the picture.